Heredity plays a key role in the aging of the male face producing everything from deep lines and jowls to the so-called waddle under the chin. The progressive lessening of skin tone, stretching of muscle attachments, and redistribution of fat cells contribute to the aging of both face and neck. The Face & Neck Lift provides a potential alternative to this otherwise inevitable progression. A FEMALE FACE & NECK LIFT IS NOT USUALLY THE BEST CHOICE FOR A MALE. Said another way, the best operation for a woman is not necessarily the best operation for a man. The earliest face-lift procedures – when it seemed that only movie stars and wealthy widows had them – tightened the skin alone to take away wrinkles. 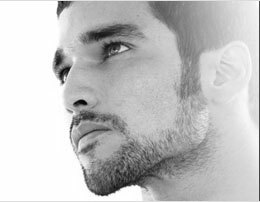 Those early procedures, when performed on men, frequently produced a too-tight, mask or feminized look. Today, thanks to advanced surgical techniques, a more natural appearance is achieved by restoring sagging muscles to their original positions before removing lax skin. Early face-lift procedures placed a great deal of tension on the incisions and frequently produced wide, obvious scars. Modern techniques transfer tension to deeper layers reducing incision tension and lessening the chances of scar widening. Newer techniques encourage maintenance, rather than reconstruction, whenever possible. Men, because of skin types, hair styles, and limited use of cosmetics, benefit from modified – less extensive – procedures that concentrate on the neck and nasolabial regions. Incisions for men tend to be shorter than those for women to allow for easier concealment. While sensible diet and exercise are always healthy life choices, they may not be enough to rejuvenate a jaw line or enhance a neck profile. With this in mind, a Face & Neck Lift may also reduce and reposition the fat pads responsible for double-chin or jowls. A Face & Neck Lift is performed under sedation or general anesthesia and usually takes 3-4 hours depending on the extent of the operation. Most patients go home the same day with a nurse in attendance for the first night. While you might return to a desk job in one week, most recover for two weeks before returning to work and feel comfortably presentable by the end of the second week after operation knowing that improvement usually continues for up to a year. If you want to improve your jaw and neck lines – consider the Face & Neck Lift tailored to your unique needs. Your face is always a good investment.